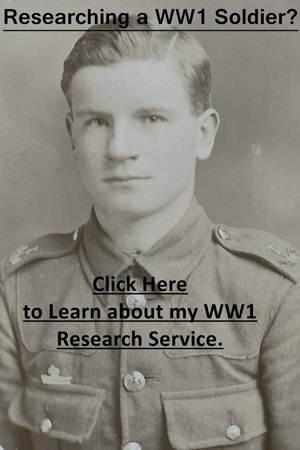 When researching a soldier who served in the First World War you will quickly come across words which relate to the structure of the British Army. Before conscription was introduced in 1916, a soldier could choose which regiment or corps to join. A Regiment could be either cavalry or infantry, with each infantry regiment containing a number battalions. Certain regiments could trace their lineage back hundreds of years and most drew their recruits from a particular part of the country. Four Battalions (three from February 1918) would form a Brigade and three Brigades would form an Infantry Division. Two or more Divisions would form a Corps and two or more Corps would form an Army Group. I’ve written another article focusing solely on an infantry battalion: Structure of a British Infantry Battalion in the First World War. Establishment: 1,007, including 30 officers. An Infantry Battalion was divided into a Headquarters, Machine Gun Section and four Companies (usually lettered A-D, though also 1-4, and W-Z) of 227 officers and men. Companies were split into four Platoons of approximately 50 men, with Platoons being subdivided into four Sections of 12 men. Five officers of The King’s Own (Royal Lancaster Regiment). In total, there would be 30 officers in a Battalion. It was not unusual for a Battalion to lose 50% of their officers in a single day’s fighting. On the opening day of the Battle of the Somme, 1 July 1916, at least 19 battalions suffered 20 or more officer casualties. The regiment of these officers can be identified from their cap badge and shoulder titles of a lion with Kings Own beneath. Headquarters: 4 Officers and 23 Other Ranks. 4 Battalions: 120 Officers and 3,908 Other Ranks. Horses: Riding: 65. Draught: 112. Heavy Draught: 34. Pack: 36. 1 Headquarters: 15 Officers and 67 Other Ranks. 3 Infantry Brigades: 372 Officers and 11,793 Other Ranks. 1 Headquarters Divisional Artillery: 4 Officers and 18 Other Ranks. 3 Field Artillery Brigades: 69 Officers and 2,316 Other Ranks. 1 Field Artillery (Howitzer) Brigade: 22 Officers and 733 Other Ranks. 1 Heavy Battery and Ammunition Column: 6 Officers and 192 Other Ranks. 1 Divisional Ammunition Column: 15 Officers and 553 Other Ranks. 1 Headquarters Divisional Engineers: 3 Officers and 10 Other Ranks. 2 Field Companies: 12 Officers and 422 Other Ranks. 1 Signal Company: 5 Officers and 157 Other Ranks. 1 Cavalry Squadron: 6 Officers and 153 Other Ranks. 1 Divisional Train: 26 Officers and 402 Other Ranks. 3 Field Ambulances: 30 Officers and 672 Other Ranks. Total: 585 Officers and 17,488 Other Ranks. Horses: Riding: 1,471. Draught: 3,350. Heavy Draught: 644. Pack:127. I’ve written another article focusing on the establishment of a British cavalry regiment: Structure of a British Cavalry Regiment in the First World War. A Cavalry Regiment was divided into a Headquarters, Machine Gun Section, and three Squadrons. The Squadrons were usually designated A-C and each contained 227 men, commanded by a Major. A Cavalry Brigade contained a Brigade Headquarters, 3 Cavalry Regiments and a battery of the Royal Horse Artillery. Its establishment varied depending on whether it was acting as part of a Division, or independently. If operating independently a cavalry brigade would contain units from the Royal Engineers and Royal Army Medical Corps. Below is the establishment of a Cavalry Brigade not allotted to a Cavalry Division. Headquarters: 7 Officers and 47 Other Ranks. 3 Cavalry Regiments: 78 Officers and 1,569 Other Ranks. 1 Horse Artillery Battery: 7 Officers and 215 Other Ranks. 1 Ammunition Column: 2 Officers and 115 Other Ranks. 1 Field Troop: 3 Officers and 74 Other Ranks. 1 Signal Troop: 1 Officer and 42 Other Ranks. 1 Cavalry Field Ambulance: 6 Officers and 118 Other Ranks. Total in the field: 104 Officers and 2,180 Other Ranks. Horses Riding: 1,826. Draught: 581. Pack: 32. Headquarters: 15 Officers and 81 Other Ranks. 4 Cavalry Brigades: 340 Officers and 6,532 Other Ranks. Headquarters Cavalry Divisional Artillery: 3 Officers and 17 Other Ranks. 2 Horse Artillery Brigades: 38 Officers and 1,324 Other Ranks. 1 Field Squadron: 7 Officers and 184 Other Ranks. 1 Signal Squadron: 8 Officers and 198 Other Ranks. Total: 439 Officers and 8,830 Other Ranks. Horses: Riding: 7,350. Draught: 2,378. Pack: 87. A Corps would contain two or more Divisions and was one step below an Army Group. A Corps should not be confused with those units of the arms of service which had Corps in their title, Royal Army Medical Corps, Army Service Corps etc. An Army Group would contain two or more Corps.